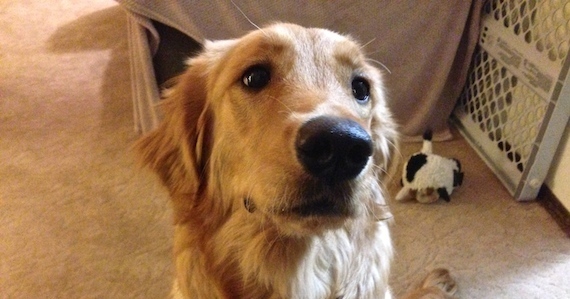 Sophie is a nine month old female Golden Retriever who mouths her owners hands, barks for their attention, jumps up on them and only listens when she feels like it. When I arrived for the session she met me with a warm excited energy. After giving my leg a nice sniff she started to jump up on me. I blocked her the first time, but she jumped right back up so I applied a technique I have developed to stop that behavior. Sophie disagreed and protested, but I stayed with it and after three corrections, she stopped jumping up for the rest of the session. When I sat down with her owners to discuss what they wanted out of the session, I learned that Sophie hadn’t been walked in a bit due to the cold weather and snow. While she is not a super high energy dog, Sophie is a pup who has an abundance of energy. I strongly suggested that her owners start taking her out for daily walks to burn some of her excess energy. If we don’t give a puppy a way to let out that energy, it can often lead to behavior issues. It took all of a few minutes to see that was the case with Sophie. I suggested that her owners engage her in other activities to burn this excess energy. As a retriever, an obvious choice is the fetch. While its no substitute for a daily walk, spending 10-15 minutes playing fetch will go a long ways toward providing Sophie the release she needs. Before I could start working with Sophie, I needed to get her to calm down. She was bouncing all over the place; circling the room, barking for attention to her owners and trying to rub herself on them. The rubbing is a way of marking them so I started to show them how to disagree with that behavior but then she started to bark at them for attention. Worst of all, they started to give it to her. All of these things told me that Sophie considers her authority equal to, if not superior than her owners. To help her settle down I placed her on a leash then stood on it a few feet from her head. As soon as the leash went on, the barking stopped. Once she sat down, I waited a sec to make sure she wasn’t getting right back up, then slid my foot closer to her to take the tension off the leash. A minute later she layer down next to me and he energy dropped, leaving her completely calm. Her owners will need to apply this technique immediately the moment she started to get over excited or when she is defiant. By constantly applying this leash-time-out until she stops protesting or her energy returns to normal we can help her understand the behavior and energy we expect from her. While this is a great technique to help Sophie learn to calm down, it stats to loose its effectiveness when a dog is not getting regular constructive exercise. While the lack of exercise was one issue, Sophie’s owners hadn’t put any rules, boundaries or limits in place inside their home. This is fine with a dog that is balanced and well behaved, but disastrous when you have a higher energy pup. I showed her owners how to establish boundaries and suggested a few rules to start enforcing. Even something as small as asking a dog to sit before you pet it can go a long way to changing the leader follower dynamic. Next I showed her owners an exercise that will help them practice leading Sophie while giving the dog the opportunity to practice following their lead. I was able to get Sophie through it one time, but during the exercise Sophie gave me a few clues that indicated she was a little stressed and also somewhat insecure. I could see her confidence draining and she was starting to shut down so I changed things up and went through a recall exercise. I love introducing this exercise in these sorts of situations as its a great way to use positive reinforcement while condition a dog to listen to and follow the command of multiple people. It only took a few moments before Sophie’s confidence returned. It was nice to see her moving with a confidence; head held high, immediate response, a bounce to her step and politely sitting in front of whomever called her. We continued for a few moments which gave me the ability to coach her owners through some hand motions and body language to help better communicate with Sophie. With Sophie’s confidence at an all time session high, I returned to the leadership exercise and was able to get her through it with better results. She was still hesitant at first, but as we practiced, she was able to figure it out. After coaching her owners through the exercise with equal success, I went over how they can use the exercise to increase her respect for them while improving her interaction and behavior with them. By the end of the session, Sophie’s energy and demeanor were noticeably calmer and she was showing her owners more respect. A lot of this was the mental exercises we went over; they really droned her excess energy. If her owners are able to drain and channel her energy consistently, the new communication methods and exercises should do the rest.